Both women are in love with him, but he loves Tourvel (in denial). Help, help me, Gerr N! Actors, remember, in order for you to have the last word (you are on stage, not me), you have to start talking first. Before I tell what to do, I listen. If we are doing our job right, we have a dialogue -- this is what your have to have with the public! Your dialogue starts with the dialogue with yourself! This script is short on taking (gibing) out and asks a lot to be put in. Try Method and see for yourself. Or reread a good play, 3 Sisters, for example. The text of the play is in THR Office and Library. All question must go to 3sis eGroup; your cyber home for next 3 months. Go and read the archives: character exploration, analysis and etc. Scenes and monologues for auditions (Jan. 26). 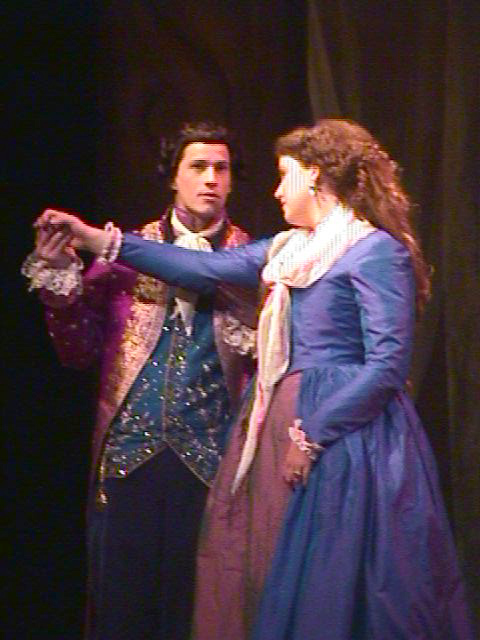 The mannerism, the show they put on all the time (mostly for themselves), the culture of Rococo: she opens her legs, he puts his hands on himself, they don't touch each other -- the foreplay is everything. Big Lesson: Do not direct a play unless you are in love with it for many years!